Table-topping North Shields coasted to a comfortable win over near neighbours Whitley Bay on Saturday. This despite two late consolation strikes from the visitors which gave the final scoreline a disjointed look. Shields appeared in complete control of the derby clash from the off and included three players in their starting line-up with Bay connections in keeper Kyle Hayes, midfielder Gary Ormston and front runner Denver Morris, whilst the Seahorses included new acquisition Kyle Patton on the bench. The Robins were buoyant after a resounding 4-0 success at Seaham midweek, and they all but led with a mere four minutes on the watch as Curtis Coppen rattled the visitors’ crossbar with a blistering strike from distance. The home pressure continued with both Dan Wilson, leading the line well, and Ryan Carr both going close before the 20-minute mark saw Carr upended in the box by full back Callum Munro and up stepped Robins hot-shot Lee Mason to bury the ball past Tom Flynn. Bay tried to respond and Jake Fowler clipped the home woodwork with a free kick, but a minute later it was 2-0 with Wilson excelling up the left flank and Carr sending his header from the cross nestling sweetly in the net. It was now a matter of damage limitation for Whitley as they continued to be torn apart by the Shields raids, but Flynn stood firm as Morris and Mason all but extended the hosts’ advantage. On the resumption, centre half John Parker found himself up front and his goalbound effort was frantically blocked, then Morris drilled just past the upright. Morris was instrumental in goal number three, his centre struck firmly on the volley by Wilson that was bravely blocked by Flynn but Mason was lurking to coolly slot in the loose ball for his 17th goal of the campaign. Shields took their foot off the pedal and slackness at the back allowed debutant Patton to slot into an empty net ten minutes from time. Gareth Bainbridge all but added a fourth with an effort deflected agonisingly wide, Bobby Taylor tested Flynn with a fierce drive and a stretching Wilson so nearly touched in a cross. But deep into stoppage time at the other end Hayes punched clear but Adam Shanks drilled in a clinical finish to make it 3-2. Robins boss Jon McDonald was delighted with his team’s performance but thought the scoreline could have been much more decisive. 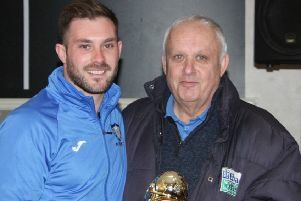 “I thought Curtis Coppen and Lee Mason were particularly outstanding, but overall it was another impressive all round team performance,” he said. McDonald comes up against his former club when West Allotment Celtic travel to the Daren Persson Stadium on Saturday, kick-off 3pm. North Sields: Hayes, Summerly, Lancaster, Coppen, Parker, Hughes, Morris (Taylor 72), Ormston, Wilson (Bainbridge 84), Mason, Carr (Holmes 72). Subs not used: McKeown, Forster. Whitley Bay: Flynn, Munro, McDonald (Haley 61), Wilkinson, Nearney, Allen, Fryatt (Powell 74), Fowler, Robertson (Patton 68), Shanks, Kempster. Subs not used: Keltie, Gibson. North Shields have been drawn at home to fellow Northern League first division side Chester-le-Street Town as they enter this season’s FA Vase competition at the second round proper stage. The tie will be played on Saturday, November 12, kick-off 3pm.